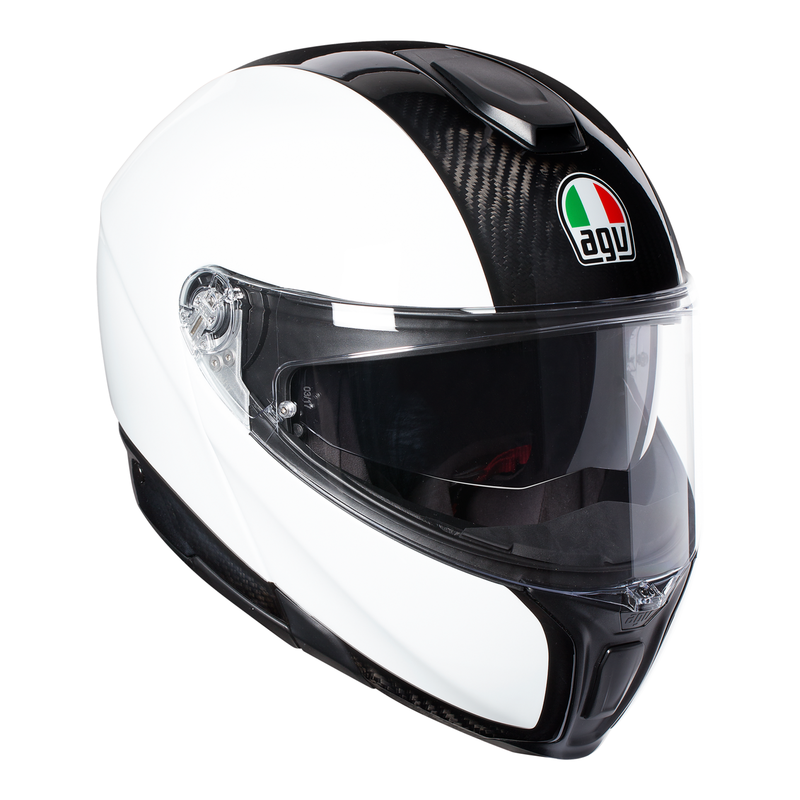 The worlds first Sport Modular helmet, now in an aero Carbon and White colourway. Entirely built in carbon fiber, both shell and chin, this specific structure achieves the same protection performance of MotoGP's Pista GP R in an incredibly light weight construction at only 1295 grams! Combing the highest levels of comfort and safety. Designed to offer 190 degrees of horizontal view as the human eye capability, the Sport Modular has been conceived in the wind tunnel for superior quietness, aero stability and ventilation. Shell in 100% carbon fiber engineered in 3 sizes with 5-density EPS structure developed in 4 sizes. 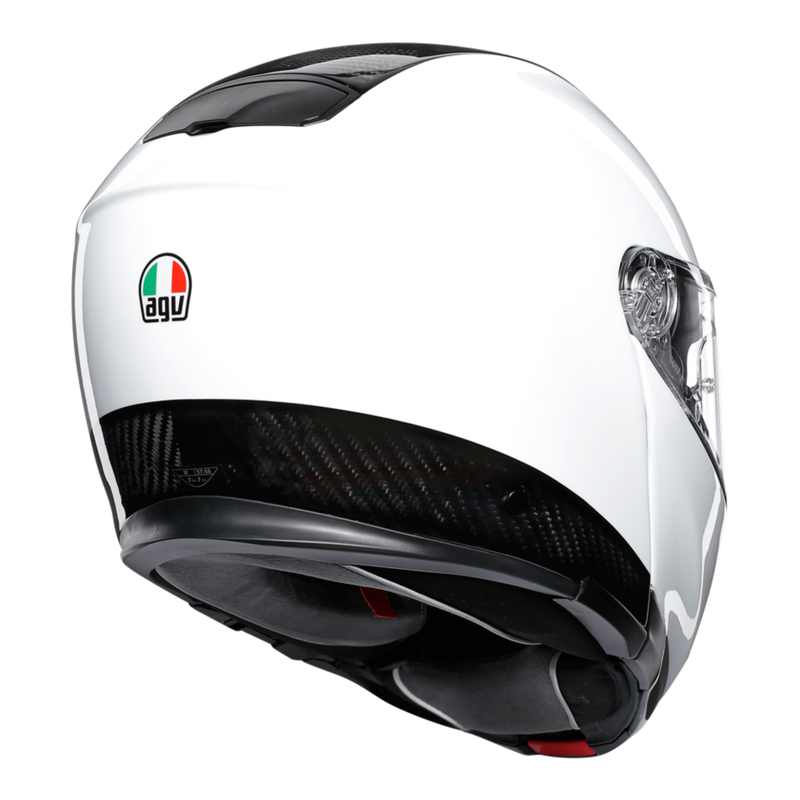 The structure offers an extremely safe and compact helmet. Chin guard in 100% carbon fiber engineered to guarentee maximum lightweight and balance even in open configuration. Shell shape is designed to minimize the risk of impact engergies being channeled to the collarbone. The metal chin guard opening system is designed to prevent accidental openings. 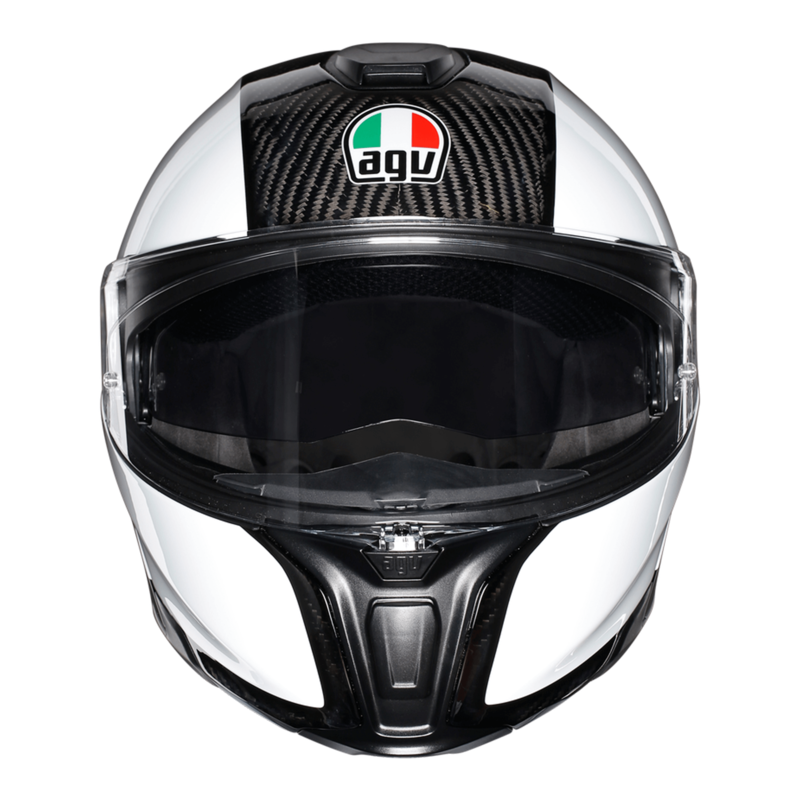 IVS (Integrated Ventilation System) ventilation with a large front vent, a chin guard vent and a rear extractor hollowed in the shell which direct air to the riders head without interferance with the internal sun visor. Internal chin channels distribute the air flow evenly through th entire visor surface. Shell shape is designed to maximise the aerodynamic performance and to have zero dynamic weight at 130 km/h (80mph). The adjustable intergrated spoiler reduces turbulence and maximises stability. SportModular interiors' construction is engineered to all an embracing, pressure-free fit and to reduce the noise inside the helmet. Removable nose guard and wind protector. Patented reversible crown pad features a double face use that allows the rider to select the preferred feel and climate. 1 - Warmer side: with Shalimar fabric for a soft and gentle touch. 2 - Cooler sider: with Ritmo fabric for a fluid and fresh fit. The interior of the helmet is designed to offer the highest riding comfort. All parts are easilly removable and washable. 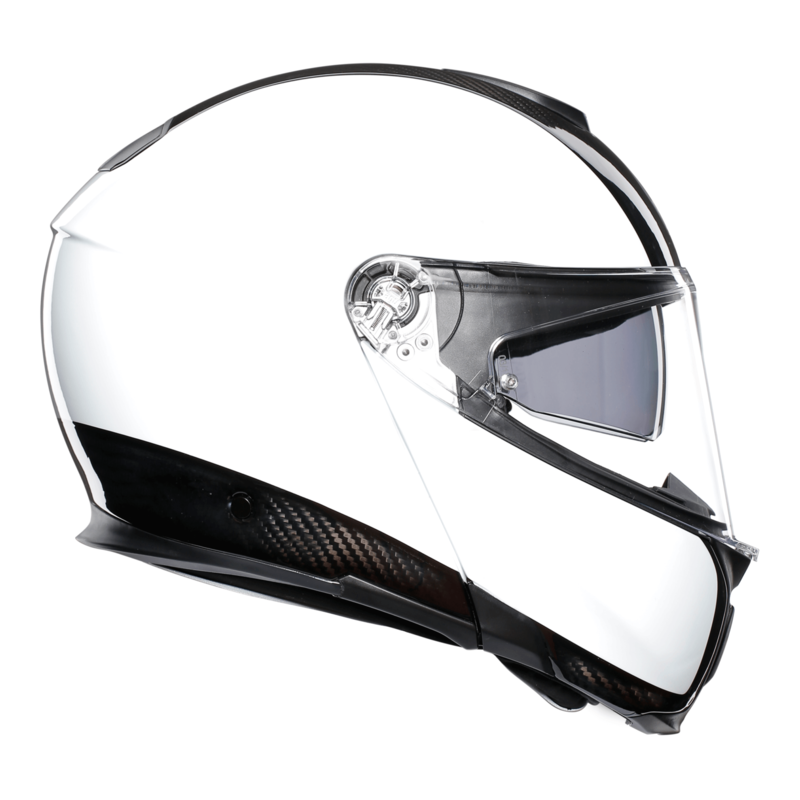 1 - Neck rocll: Shalimar and Nabuk fabric with water resistant treatment prevents water from being channeled inside the helmet. 2 - Cheek pads: Ritmo fabric with Sanitized (antibacterial protection) 2Dry (moisture wicking) and Microsense(premium skin comfort and wearing fluidity) treatments. 3 Crown pad: Shalimar (warmer side) and Ritmo (cooler side) with the same treatments listed for the cheekpads. Fit especially designed to allow wearing glasses. New Optic 1 visor with 100% max vision Pinlock (120) anti-fog technology is designed for maximum vertical view (85 degrees) and unmatched horizontal view (190 degrees). It features 3 steps. The GT3 visor is anti-scratch and is available in 2 different sizes to optimize the correct fit between visor and shell in any size and to reduce air drafts and noise (GT-31 for XXS-L and GT3-2 for XL-XXXL). Integrated anti-scratch sun visor, removable without using tools. It is available in 2 sizes (IV7-1 for XXS-L and IV7-2 for XL-XXXL). Patent Visor Lock System (VLS) reduces the risk of accidental openings. Unique metal visor mechanism designed to minimize surface area, therefor supporting peripheral view and impact performance. Rapid visor release system requires no tools and allows the visor to be removed and replaced in seconds.